With threats to wildlife constantly increasing, conservation policies are being put in place in order to protect biodiversity. However, with limited resources available, these policies have to attempt to prioritise certain species according to their “value”. New research, led by Newcastle University, the Swedish University of Agricultural Sciences and the British Trust for Ornithology, has shown that prioritising based only on one key species “value” could put some of our best loved wildlife at risk. 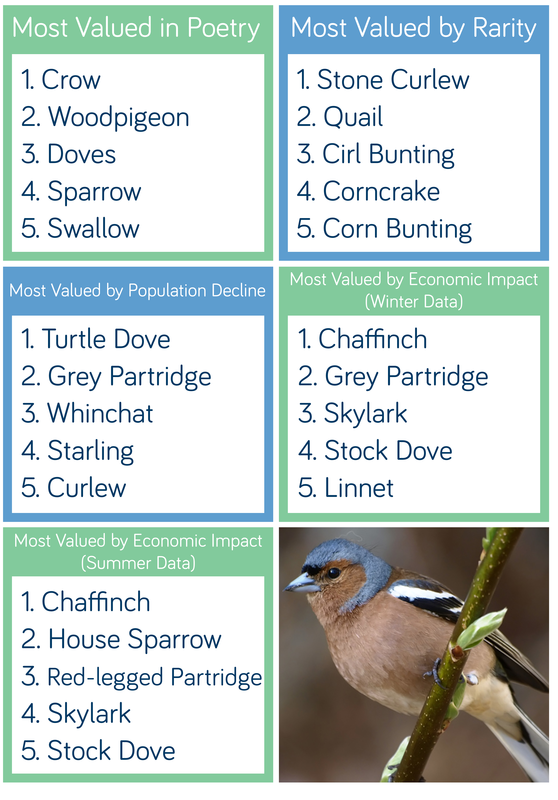 The research, which focuses on UK farmland birds, categorises according to three core values – conservation priority value, economic value (consumers of weed-seeds) and cultural value, measured through poetry. “Considering one value in isolation gives you a very skewed picture of what’s important and what isn’t. “Birds such as the chaffinch might consume large numbers of weed seeds which helps farmers, but they aren’t rare and compared to other species they barely feature in poetry. Professor Whittingham says that although this study only looks at a small selection of the potential ways individual species can be valued for different purposes, based on the evidence the more values that are considered the more species are likely to be important. “Prioritisation makes sense when you have scarce resources but there is an inherent danger that by going down that route we take our eye off those species that are just as valuable to us but in less tangible ways. Protecting biodiversity is a pressing issue with habitats and species being lost at a devastating rate. Ensuring that the most valuable species are prioritised is vital to the success of certain conservation policies, however, as Newcastle University research proves, placing “value” on a species can be a tricky process and a whole range of things need to be considered in order to best grasp the impact an animal has both culturally and environmentally. Find out more about Newcastle University’s ecology and conservation research here.